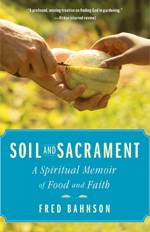 In this excerpt from the prologue of his new book, writer Fred Bahnson recounts his visits with four different faith communities -- Catholic, Protestant, Pentecostal and Jewish -- to explore the connection between feeding the spirit and feeding the body. Winter is my favorite growing season. Anyone can toss down a few seeds in June and get a crop, but it takes a disciplined hope to garden in the dark of December. And what rewards. After several frosts, plant starches become sugars. Carrots attain the sweet crunch of apples, and kale loses all hint of bitterness. Turnips become so sugary you can eat them raw. Mid-morning on the first Sunday in Advent, I stood beside the red-roofed barn and looked out at Anathoth Community Garden. Down the hill the greenhouse was shedding its frost in the first light. Along the creek sat the children’s playhouse, and beyond that the site of our future orchard. But the sight that always drew my eye was the wide expanse of the field itself, a wave-and-trough succession of raised vegetable beds lying dark and still in the low winter light, pregnant with life waiting to be born. Soon I would need to drive a mile down the road to the little Methodist church where my wife and sons would be arriving for the morning service, but first I needed to come here, to this five-acre piece of land that had come to feel like an extension of my own body. Over the past three years of working here I had grown attached to this garden and its people. They had fed me in so many ways. Perhaps too many ways. I walked downhill to the greenhouse, a Gothic arch structure where we grew most of our winter crops and started all our seed. Heated entirely by the sun and ventilated by wax pistons, it was off the grid. This was my favorite of winter places, my sanctuary; I could lose myself in here for hours. What a thrill I received each morning as I entered this congregation of plants, lit as if from within by the low winter sun. The world outside the greenhouse was nineteen degrees cold; dry and lifeless. Once I stepped across the wooden threshold, the temperature rose to a balmy forty, lush and humid and alive with the earthy aroma of plants seeking light. The soil here was deeper than in the rest of the garden, the color and consistency of chocolate sponge cake. Even on the coldest of winter days, black organic matter in the soil absorbed the sun’s heat and slowly released it at night, keeping the plants alive. The beds, each four feet wide and thirty feet long, were double-dug. While the topsoil of a rototilled garden descends a mere eight inches, our greenhouse beds reached a depth of at least two feet, mimicking the fertile, loamy soils of the American prairie or the Russian steppe. With such deep beds, roots have better access to water and minerals deep in the ground. Plants can be spaced closer together, quadrupling yield. Thousands of years ago the Greeks realized that plants grew better in mountain landslides. The deep soil there was loose and friable, allowing the roots easy access to nutrients. A double-dug bed is like an underground landslide. Roots flourish in such deep tilth, creating a vast subterranean network that feeds aboveground life. I spent much of my time at Anathoth preparing and working and thinking about the soil. There is an entire ecosystem in a handful of soil: bacteria, fungi, protozoa, nematodes, earthworms. Through their breeding and dying such creatures vivify the world. This pattern of relationships I find a captivating mystery; I love plants, but I am most attracted to the fervent and secret work that goes on beneath the surface. Soil is not dirt. It is a living organism, or rather a collection of organisms, and it must be fed. Soil both craves life and wants to produce more life, even a hundredfold. The true profundity of our soil was difficult to gauge. One day I slid my hand into one of the greenhouse beds. I gently pushed down and kept pushing until my arm vanished and my shoulder touched the soil’s surface. It had seemed then as if I could keep burrowing downward, until my entire body was swallowed by the warm, dark earth. Soil is a portal to another world. The garden is our oldest metaphor. In Genesis God creates the first Adam from the adamah, and tells him to “till and keep” it, the fertile soil on which all life depends. Human from humus. That’s our first etymological clue as to the inextricable bond we share with the soil. Our ecological problems are a result of having forgotten who we are -- soil people, inspired by the breath of God. “Earth’s hallowed mould,” as Milton referred to Adam in Paradise Lost. Or in Saint Augustine’s phrase, terra animata -- animated earth. Tilling is, in fact, often harmful to soil structure and creates erosion. Since World War II, as a result of excessive tillage and use of petrochemicals, we’ve managed to squander a third of our country’s topsoil. With the combined challenges of climate change, peak oil, and the global food crisis, the balance of life on earth is rapidly approaching a tipping point. In the ways we grow our food and in the food we choose to eat, we have largely lost our connection with the adamah; we have failed to live in the garden. By 2011 nearly two years had passed [since our leaving Anathoth], two lovely years of building a new life on the land with my family, yet … something within me remained unsettled. A decade ago in Chiapas, Mexico, I had discovered the connection between the cultivation of crops and the cultivation of the spirit. I had sensed a calling to feed people, and my subsequent years at Anathoth had been a crucible in which I’d leaned into that calling. But now, despite a contented family life on our own piece of land, I felt an acute spiritual hunger that could not be filled. I would need to revisit those years from my past, only this time from a different vantage point. While I knew something about soil -- feed the soil, the soil will feed the plants, and plants will feed the people -- I was only just beginning to embrace a sacramental life, a life of drawing nearer to God. I grew up in a Christian home, was a missionary kid in Nigeria for three years, attended divinity school, taught the New Testament to undergrads, and started a communal garden ministry for a Methodist church, which is to say that all my life I’ve been immersed in various Christian subcultures. Yet I realized at age thirty-eight that I was only just beginning my spiritual journey. When I went to church I mostly felt bored. But I believed that the Living Christ was real -- I had met Him at Anathoth in the faces of strangers, even enemies -- and I wanted to find Him again. I somehow needed to start from scratch, to approach the faith with the eyes of a new convert. I wanted answers to some fairly simple questions: What does it mean to follow God? How should I live my life? And what does all this have to do with the soil, the literal ground of my existence? These most basic questions had become incessant preoccupations. What I was really after, I realized, was that age-old quest for a life of holiness. A life of wholeness. In Luke’s story of the disciples meeting Jesus on the road to Emmaus, they knew him not. Only when they broke bread at the same table did they recognize him. For two thousand years, through the sacramental elements of the Eucharist and in table fellowship, people have sought Jesus in the breaking of the bread. Perhaps, I thought, one could also seek him in the growing of the wheat. During my Anathoth years I had experienced God’s presence in the act of growing food with others. In order to understand those experiences, I embarked on a new journey to seek out others, both living and dead, whose calling was similar to my own. I plumbed the riches of living Christian and Jewish tradition. I decided to dig deep into the soil of the burgeoning twenty-first-century food and faith movement about which I’d been hearing many good things, to learn about the cultivation of soul and soil from the examples of those I encountered. The search for an authentic life is an old one. When the early Christians went to the desert, this is what they prayed: We beg you, God, make us truly alive. That fourth-century prayer was not the prayer of people patiently awaiting their ticket to heaven, just biding their time on earth; it was the urgent and anguished and utterly rooted prayer of people who wanted God to make them more fully here now. Those fourth-century monastics fled to the desert because they were being drawn toward life. They knew that their society, a bloated culture of excess and spiritual emptiness, prevented them from becoming the humans God wanted them to be. Like these early monastics, I had a desire to live a life of integrity and wholeness, to become more fully alive. And I decided to look for the fulfillment of those desires not in the desert, but in the garden. Over the course of a year I would visit a different garden for each of the four seasons, each visit coinciding with a liturgical holiday. I traveled as an immersion journalist, but also as a pilgrim. This journey was a quest to find those modern prophets who might teach all of us better ways to be at home in the world. I visited a Trappist monastery in the South Carolina low country where I prayed the Divine Office with the monks and learned to grow mushrooms. At a model community garden started by several Protestant churches in the mountains of North Carolina I asked a blessing over a potluck meal and renewed my faith in community. I ran a prayer gauntlet with Pentecostal organic farmers and meth-cooks-turned-coffee-roasters in Washington’s Skagit Valley. And finally, in what struck me as the completion of a sacred circle, I traveled to a Jewish organic farm in the Berkshires where I davened in a red yurt in the predawn hours, celebrating the bounty of the fall harvest according to ancient tradition. Each of these garden communities arose out of their particular place and context. They were small, even obscure, which meant they were in little danger of being commodified or otherwise co-opted. Over the course of that year I would discover many things: That times of intentional solitude deepened, rather than distanced, my relationship with others. That manual labor disciplined not only the body but also the spirit. That trying to save an imperiled world is for naught unless that work is undergirded by a rigorous prayer life. And everywhere I went, I witnessed how our yearning for real food is inextricably bound up in our spiritual desire to be fed. During my four years at Anathoth there were times when I caught a glimpse of what the biblical writers called shalom, a right relation not only with God and people but with the adamah; I had experienced profound moments when people and the land coexisted in blessèd armistice, times free of struggle, and in those moments it seemed as if God’s glory had come to dwell in the land, as the Psalmist promised, a time when justice and peace would kiss. And so I went looking for these glimpses of shalom among others who were trying to live again in the garden, in the most expansive sense of the word. I began my journey in Advent, the beginning of the Christian year, and as the time drew near to embark, I began to think of my quest as really a journey to four spiritual strongholds, fortresses of power both sacred and profane. It was this balance of the holy and the mundane that attracted me. In each place I felt a palpable and immediate sense of the Divine Presence, yet that mystery arose from the daily tasks of growing mushrooms, milking goats, planting carrots. Each of these communities produced some of their own food, making them less dependent than most of us on a centralized, oil-addicted food system that is already showing signs of collapse. That simple act of growing food gave them something most of us don’t possess: agency. They had regained a measure of freedom from anxiety. But there was also something more mysterious at work in these places. A merciful Presence brooding over the bent world. The answer to our hunger for more than just bread. To grow and share food with others in a garden is to enter a holy country. American spirituality is discovering itself anew as people of faith reconnect with the land. But while the buy local, eat organic movement is increasingly in the public eye, the faith-based food movement remains virtually unknown by the wider public. At times it intersects with its larger cousin, but mostly it charts a parallel course, composed of many people who’ve neither heard of Michael Pollan nor set foot in a Whole Foods. Many of those I’ve come to meet in this loosely woven movement view soil as a sacrament: a physical manifestation of God’s presence, a channel of Divine grace. They know soil is a portal that joins us to the world to come even while rooting us more deeply in this one. Through the practices of caring for the soil, those I encountered had discovered a way to become more fully alive. What follows are the stories of people who have aligned their lives with the real. They have sought from God, and been given to find, the patterns of life that made them more holy. More whole. More human. This was the way I was seeking, and this was the way I was given to find. We beg you, make us truly alive.